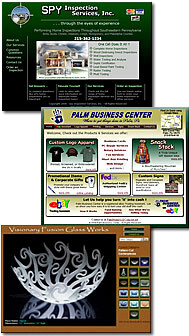 Web Creations by Z is your one stop shop for all your web site needs. Whether a basic web site or a more complex web-based application, our quarter of a century experience in software development insures we’ll get the job done right. Every web site need a name! Web Creations By Z can help you register and manage your domain name. We take great care to mind the details. Whether your project is large or small, our Website Planning Guide and Development Methodology help us define project goals and how to get there. - Content Managed Web Sites - Need to update information often or want to publish a schedule or current news items? Our content management systems can do the trick nicely. Learn more about our content managed sites. Your web site is an electronic ambassador for your business. It should be current and well versed. Our maintenance packages are an affordable way for clients keep their web site up-to-date with their business. At Web Creations By Z, we match our clients with the hosting package that best serves their needs. All come with generous storage and transfer limits and economically priced. Whether it’s submitting your site to the search engines, creating a search engine marketing (pay-per-click) ad campaign, or promoting your site through printed materials with our partners at Graywolf Designs, Web Creations By Z can help get your site noticed.